Service composition is a term in Cloud Computing which describes the way in which the services are linked. Since the terminology mostly used in the area of service-oriented architecture (SOA), it is also common in usage among Web Service Composition. There are two types of Service Composition in Cloud Computing : Cloud orchestration and Cloud choreography. A service composition can consist be of one type only or a composite of two kinds. Service composability is a design principle, applied within the service-orientation design paradigm. This article on Service Composition in Cloud Computing must not be copied for Thesis, Wikipedia etcetera purposes without paying our fees for reproduction. Cloud Orchestration is a way to flexibly combine multiple services into a composition. This composition describes an executable business process. Both the corporate and external enterprise services can be combined. The process flow is controlled by a subscriber. Each service thereby has a limited field of scope and can be used for the defined processes only within this visual range. Activities remain hidden behind a direct communication partner. Web Services Choreography Description Language (abbreviated as WS-CDL) is the part of the so-called WS-* specifications. It is an XML language based, language for peer-to-peer communication method between various web services. WS-CDL is, as the name says, a choreography language. In case of Cloud choreography each service describes its own task in the entire composition. There is no central point of control or way to check correctness and performance of the work. The focus is on the exchange of messages between the services. WS-Business Process Execution Language (BPEL) is an XML -based language to describe business processes, whose individual activities are implemented through web services. WS-BPEL is part of the so-called WS-* specifications as an industrial standard from OASIS. The orchestration contains a description of services, their conditions for calling and dependencies and the alternatives. Here, the process from the perspective of being seen as “stakeholders”, i.e. it calls the other processes. 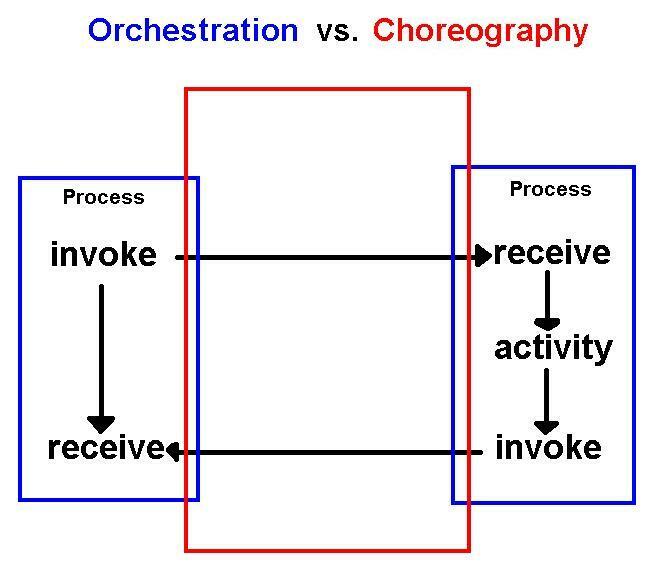 on the right is the orchestration of the local description of a (business) process (blue in the picture), while the choreography involves the interaction of multiple processes (red in the picture). It is also very nice graphical example to explain the difference between orchestration and choreography: orchestration corresponds to a traffic light controller for centralized control of all vehicles by the light signals. However choreography corresponds to a roundabout without central control. General rules on the roundabout determine how vehicles turn at the roundabout and then leave again. Another example would be the situation in a classical orchestra: Looking from the perspective of an orchestra member a single voice, then this corresponds to the choreography. If you look on the other hand through the eyes of the conductors on the score, then you get an overview of what totally runs. Consequently, this corresponds to the orchestration. This Article Has Been Shared 9126 Times! Cite this article as: Abhishek Ghosh, "Service Composition in Cloud Computing," in The Customize Windows, August 25, 2014, April 21, 2019, https://thecustomizewindows.com/2014/08/service-composition-cloud-computing/.